The manipulations of the establishment have never been more visible. I enjoy a good conspiracy theory as much as the next peddler of anti-establishment vitriol. If you can hold them loosely, conspiracy theories can keep you conceptually and ideologically fluid so you don’t settle into any single set of perceptual or cognitive habits with this political stuff, and as an added bonus they tend to consistently infuriate all the worst kinds of people at all the right times. But this article is not about conspiracy theory. What I’ll be sharing with you here are verifiable matters of public record which I encourage you to independently investigate if anything you read here is new to you. I emphasize this not because I want you to believe me, but because we need as many eyes on this stuff as possible. The American political establishment appears to have settled into an aggressive disinformation campaign against its own citizens as a result of the way it lost control of the narrative in 2016, and that campaign is only escalating. In 2005, President George W. Bush admitted in a televised press conference that the US government creates its own “news” videos to give to the press, who often air those stories with no disclaimers informing viewers that they are watching government-generated media. In 2013, the US government implemented the negation of a 1948 law which had made it illegal for it to conduct psychological operations (psy-ops) on its citizens. The 2017 NDAA allots a portion of the defense budget to a new State Department-run “counter-propaganda” program to fight certain types of information Americans are getting from the internet. So when I tell you that the American government is known to actively use the media to psychologically manipulate the American people, that isn’t some wacky conspiracy theory, it’s a fact. These people have been legalizing and legislating psy-ops campaigns because they want to use them. Whenever you hear all the talking heads on TV suddenly start using the same phrase at the same time, you are hearing a slogan, a marketing ploy cooked up by a political think tank in the same way corporate think tanks come up with slogans for their products like “I’m lovin’ it” or “Silly rabbit, Trix are for kids!” Only political slogans aren’t geared to manipulate you into buying a product, they’re geared to manipulate you into buying into an idea. In 2003 while the corporate media was manufacturing consent for the Iraq invasion, everyone suddenly started using the phrase “Support our troops.” It was everywhere. “Support our troops, support our troops!” You couldn’t watch the news without hearing it frequently peppered into the conversation, which is bizarre because taken on its own the phrase is essentially meaningless. The opposition to the Iraq war wasn’t rooted in a lack of “support” for the individuals in the armed forces, it was opposition to the invasion itself and the decision to do so made by politicians in DC. But all at once corporate media began slamming the American psyche with the absurd subconscious notion that if you didn’t support the invasion you must therefore hate soldiers and marines. Following Hillary Clinton’s loss due to counter-establishment ideas and information being circulated largely via alternative media outlets, we began seeing the phrase “fake news” being constantly bleated with very broad brush strokes in a transparent attempt to lump dissenting alternative media outlets in with Macedonian clickbait and Russian propaganda. And it was fairly successful at first; for weeks every single one of my opinion articles was getting comments calling them “fake news” despite being neither fake nor news. Alternative media was getting slammed with this deliberate government psy-op, and luckily there was a strong pushback against it wherein every time CNN or the Washington Post published an unsubstantiated and inflammatory claim there was widespread use of their own slogan against them. WaPo recently announced that it’s “time to retire the term fake news” since it’s been co-opted by the political right, and it’s true; you now hear that term being used more often on right-leaning mainstream media than on the left. By hijacking the term, they broke the spell, causing it to become an ineffective psy-op. Pay close attention to when establishment shills interject a phrase that doesn’t seem to really “fit” with the rest of their words. Whenever you see the CIA-funded Washington Post arbitrarily start babbling about Pizzagate in the middle of an article about something or someone who opposes the political establishment, even when the hard substance of the report has nothing whatsoever to do with Pizzagate, you are seeing this psy-op at work. CNN’s Chris Cuomo is an absolute wizard with this trick. The son of a former Democratic New York Governor and brother of a current Democratic New York Governor, Cuomo is political establishment royalty, and he appears to have been groomed for his job. Cuomo went to law school instead of studying journalism, but has been given a prominent spot on the media juggernaut Clinton News Network, where he routinely inserts ideas into his commentary that are designed to fly below the radar and bury themselves deep in America’s subconscious. My readers might remember Cuomo as the guy who casually slipped the absurd notion that it’s illegal for Americans to read WikiLeaks into his report, which to me is less notable for how blatantly manipulative it is than for the way Americans finally caught him in the act. It was a very brief insertion, just a few seconds long, but some alert viewers were able to isolate it and go “Hey! What did you just do there? You’re tricking us!” Which is great, but this was the only time Cuomo has really been caught in a big way. Watch the clip here and get a feel for how bizarrely his sentences are structured when you really listen to his words; whenever you see a pundit word-salading like that, it’s probably because they’re slipping a toxic idea into what they’re serving you. Watch this clip here from his town hall with Bernie Sanders where out of nowhere Cuomo inserts the idea into viewers’ minds that the oligarchy isn’t the problem Sanders makes it out to be. Notice how his comment that Joe Biden “doesn't think 500 billionaires are behind every problem that America has” had nothing to do with anything anyone was talking about at the time, including Cuomo, and how weirdly and nonsensically he slips that spell into the mix. It looks weirder written down, since he works his magic with such confidence; here’s a transcript from CNN if you want to see it in writing. You can see a more overt example here in his interview with Rep. Tulsi Gabbard, where he somehow manages to force the adamant assertion “Assad is a tyrant, that he is an oppressor of his people and he needs to be taken out in the name of democracy” into the form of a question to help inoculate viewers from Gabbard’s anti-establishment message involving Syria. It’s a magic trick. I don’t know where he learned it or why he relentlessly uses it on the American public, but the technique he’s using is called neuro-linguistic programming and it’s well-known among magicians. Check out UK magician Derren Brown who uses it extensively in his act to manipulate people into doing what he wants so he can appear to be psychic. During his show, he sprinkles subconscious messages throughout his patter so his “predictions” come true at the end. These words and phrases that are so odd and out of context that they should jump out at you, but the mind smooths it over and moves on to the next thing he says. These tiny weird little phrases don’t even need to be repeated that often for them to work. And work, they do. He can get any three people from the audience to collaborate to select a word of his choosing out of a possible 1.6 million words, seemingly at random to the participants. The only difference with Brown is that it’s a part of his reveal at the end, and he walks you through how he manipulated everyone. Watch here to see him walk an audience through how he got them to choose that one word from 1.6 million for him, complete with video clips of each insertion. I guarantee you Chris Cuomo has made a study of neuro-linguistic programming or something similar as part of his establishment grooming. His quick, rhythmic delivery and seamless insertions are the hallmark of a genius-level NLP practitioner. This psy-op is designed to forcefully marry two unrelated ideas in the minds of the audience for the benefit of the political establishment. Half a year after the Iraq invasion, a poll by USA Today found that 70 percent of Americans still believed that Saddam Hussein was responsible for 9/11. This wasn’t because reporters were directly saying this; they never could have gotten away with such blatant falsehoods. What they could get away with was consistently making sure they mentioned Saddam Hussein in the same breath as the September 11th attacks over and over again, and I remember them doing this frequently. They’d mention the “intelligence” which said Saddam had weapons of mass destruction, and then they’d say something about the possibility of another attack similar to 9/11. They did this on purpose as part of corporate media’s well-documented participation in manufacturing consent for the invasion, and it worked. 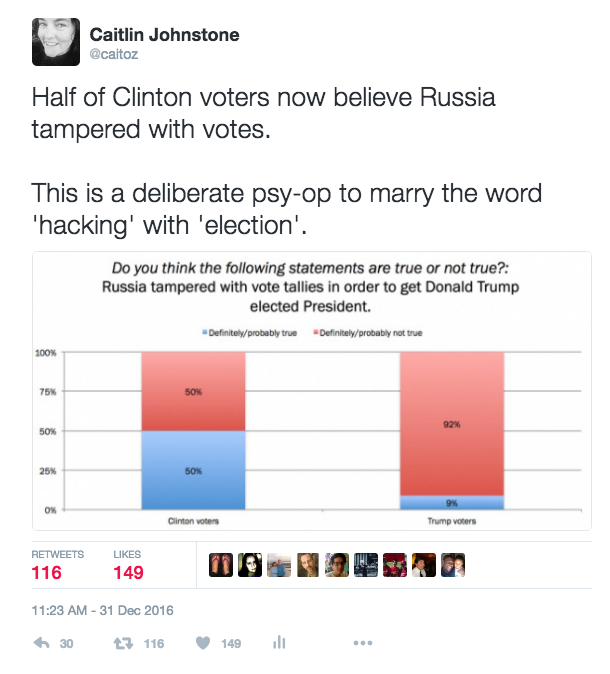 A recent YouGov poll found that 50 percent of Hillary Clinton voters believe that the Russian government tampered with vote tallies to help Donald Trump win the presidential election. This is because media outlets, nearly all of which are owned by just five powerful companies in the US, have been deliberately using phrases like “election hacking” and “hacked the election” instead of phrases like “hacked the DNC emails” or “spearphishing John Podesta’s emails” which would have been an infinitely more accurate reflection of the actual substance of their reports. People were tricked into marrying those two ideas, and now half the Democrats you meet will likely believe that Putin was involved in hacking actual election booths or vote tallies. A few days ago we saw the same thing when Donald Trump lashed out at Rep. John Lewis for saying he didn’t consider him a legitimate President; the overwhelming majority of the headlines from liberal corporate media used words like “civil rights hero” and “civil rights icon” when referring to Lewis and “attack” and “smear” when referring to Trump’s response to him. In reality Trump was just returning fire initiated by a Congressman in the opposing party, but I guarantee you there are millions of Americans who now think of Trump as someone who attacks civil rights leaders because he hates civil rights, for the same exact reason people think Russia hacked polling booths and thought Saddam was responsible for 9/11. Just the whole entire Washington Post. The entire thing is one gigantic government psy-op. Its owner Jeff Bezos has collected many hundreds of millions of dollars directly from the CIA (a conflict of interest WaPo never mentions when reporting on US intelligence agencies), and his rag has consistently been the most unapologetic promulgator of the establishment narrative. To list just a very few examples, WaPo ran sixteen negative articles about Bernie Sanders in the span of sixteen hours during the most hotly contested point in the presidential primaries, published a story which blacklisted hundreds of dissenting alternative media outlets as “Russian propaganda”, reported that Russians had hacked America’s electrical grid when nothing of the sort had happened and then covertly and unapologetically edited their article as their lies became exposed after millions of Americans had consumed their false narrative, and have been among the most aggressive peddlers of the aforementioned “Russia hacked the election” forced association psy-op. WaPo is a great resource for all clear-eyed rebels, because it can be used as a daily memo of what the CIA and the political establishment it supports want the American public to believe. Jeff Bezos is the second wealthiest person on the planet and prior to his purchase of WaPo he had already obstructed WikiLeaks via his company Amazon, so he’s unquestionably got a vested interest in propping up the oligarchy. Paying attention to his publication tells us where we aren’t meant to look. One of the first things I noticed before any campaigning had even started in the recent Democratic primary was when Hillary Clinton got caught buying millions of fake “zombie” accounts to bolster her numbers on Twitter and Facebook. They’re called zombie accounts because they’re not real people. You can buy followers pretty inexpensively it turns out, but they’re only shell accounts. They will never retweet you, they just make your numbers look better. It was the beginning of the largest and most outrageous astroturfing of a campaign we’ve ever seen. Astroturf is so called because it seeks to mimic the growth of a natural grassroots campaign — you buy followers, pay people to turn up to your rallies, offer incentives to wear your stickers and badges, pay people to go online and defend you, hand out signs at rallies that look home-made, pay celebrities to endorse you, pay your marketing campaign to make memes for you, stage “spontaneous” photo-ops with “fans" — in short, you use money to pay for the appearance of what burgeoned from the Bernie Sander’s campaign organically because there was genuine and growing enthusiasm for the candidate. Astroturfing seeks to mimic that kind of virality. These strategies are usually used by advertising companies to generate interest for a product. Check out this Ted talk by Sharyl Attkisson for a little tour. It’s well-known in the trade that word-of-mouth is by far the best salesman, so those sneaky bastards have dreamed up ways of mimicking that. What the Clinton campaign did went way beyond hiring a few shills to inject positive messages about their candidate and into the realm of mass psychological abuse, using real-life disrupters, social media shills, and the mainstream media to demonize Trump and his supporters to the point where the nation is still showing symptoms of post-traumatic stress disorder. Here’s the thing though — we can only prove that the Clinton campaign did that because of the email leaks and the fact that the FEC enforces some transparency on the activities and budgets of the campaign and its superPACS. If we didn’t have those two things, we wouldn’t have proof that it occurred. Post-campaign, you can still hire a company to shill for you online, on whatever issue you please, and you don’t have to report it to anyone. It’s relatively inexpensive and it’s a very effective way of controlling the narrative and disrupting natural healthy collaboration between normal humans. This is just a taster but according to this amazing article from Double G, I mean, Glenn Greenwald, the key tactics boil down to the four D’s — Deny, disrupt, degrade, deceive. So just because the campaign bunting has been taken down, don’t think that there aren’t regular assaults occurring on the hearts and minds of average Americans, but the good news is, they are getting easier and easier to spot. It’s a fun game; I invite you to play it with me. Let me know what other tricks of theirs you spot. Thanks for reading, fellow starry-eyed rebel. If you enjoyed this, please consider sharing it around, liking me on Facebook, following me on Twitter, or supporting me on Patreon so I can keep this gig up.